Statement to the Irish Volunteers, 24 September 1914. 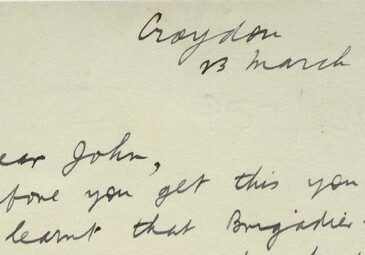 Eoin MacNeill papers, UCD Archives, IE UCDA LA 1/H/1 (6-7). Part 9 of our Centenary Special. Original statement and analysis by Dr Conor Mulvagh can be viewed below and here (in PDF). 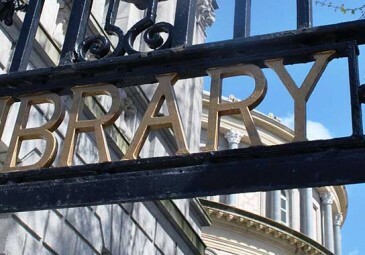 All images courtesy of UCD Archives. This month’s ‘From the Archives’ document is arguably one of the most important pre-independence documents extant in University College Dublin Archives. It was the document that split the Irish Volunteers, Ireland’s largest ever paramilitary force, one hundred years ago on 24 September 1914. However, it is a document that has been overshadowed by a much better-known statement of policy, made by John Redmond MP at Woodenbridge in county Wicklow on 20 September 1914. Redmond’s Woodenbridge speech catalysed the split of the Irish Volunteers by calling upon Irishmen to go ‘wherever the firing line extends in defence of right, freedom, and religion in this war.’ However, it is a fact of history – often forgotten – that John Redmond’s Woodenbridge speech did not split the Irish Volunteers. Redmond had embarked on a series of solo runs during the summer and autumn of 1914 which caused consternation and outright anger among his party colleagues as well as the provisional committee of the Irish Volunteers. In this regard, Redmond’s new departure at Woodenbridge was no bolt out of the blue, not least because he had stated publically in the House of Commons on Friday 18 September 1914 that he would go to Ireland and announce a new policy for the Irish Volunteers as he did at Woodenbridge. Woodenbridge was, however, the last straw for the original membership of the provisional committee of the Irish Volunteers. Redmond’s speech was made on a Sunday. By the Thursday, the founder of the volunteer force had resolved to make a stand and split the movement. He would ultimately secure the support of only seven percent of a 170,000 strong force. However, despite this numerical difference, MacNeill was only at the beginning of his involvement in the politics of separatism at this point. Redmond’s formal relationship with the Irish Volunteers stretched back to May/June 1914 when he had delivered an ultimatum to the provisional committee that they must accept twenty-five nominees of Redmond’s choosing onto the already twenty-five strong committee. Redmond had justified his move by claiming that the provisional committee had a predominance of Dublin-based members and that he wished for the movement to become more nationally representative. However, Redmond’s clear intent, now that the volunteer movement had surpassed 100,000 members acting in defence of Home Rule but operating outside the control of the Irish Parliamentary Party, was to seize power in the organisation. The proof of this can be found in the fact that, fully ten of Redmond twenty-five ‘all-Ireland’ nominees were also Dublin residents whereas two more were Irish Party MPs, based in London for much of the year. 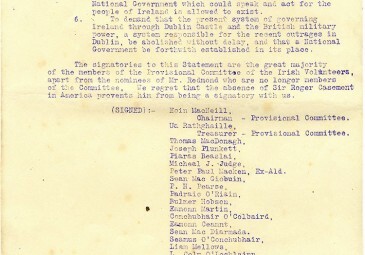 Given that Irish party sympathisers such as Tom Kettle were already members of MacNeill’s twenty-five man provisional committee, Redmond now created for himself an in-built majority on the provisional committee of the organisation. MacNeill and his associates were greatly put out by the way in which Redmond had wrested control of the force in June of 1914. Tension and discord were never far below the surface in the months that followed. Back in May, in the early days of the leadership crisis, MacNeill had written to the Irish party MP, Stephen Gwynn, admitting that, in light of Redmond’s actions, ‘All this poison of suspicion will have to be purged out, … my instinct tells me that action based on apprehensions and suspicion contains the germ of a rapidly consuming disease.’ The degree to which this disunity festered in the leadership of the volunteers can be seen from August’s ‘From the Archives’ post were it was shown that Redmondites and republicans sent out rival gun running missions to Europe in an attempt to secure arms for the Irish Volunteers during July and August of 1914. 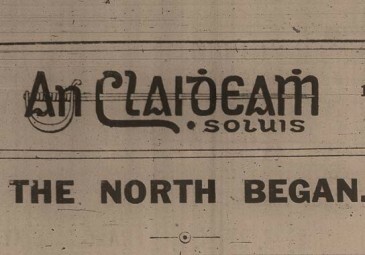 Ultimately, the advanced nationalists centring on Roger Casement and Erskine Childers were successful while Tom Kettle, as Redmond’s emissary, took until late-August to deliver his consignments of rifles: long after the republicans had scored their major propaganda victory at Howth on 26 July. The more immediate origins of the Woodenbridge split can be traced back to 3 August, the day before Britain declared war on Germany, when Redmond promised parliament that the Irish Volunteers would defend the coastline of Ireland from foreign invasion thus freeing up imperial troops for service on the Continent. This was done without consulting the provisional committee of the Irish Volunteers and, incidentally, without seeking the advice of Redmond’s closest party colleagues either. At this point, MacNeill and his associates were angered but not, as yet, prepared to split the movement. Redmond’s announcement had been popular, especially in British political circles and MacNeill had been convinced by Redmond not to scupper the political momentum by disrupting the outward appearance of unity. 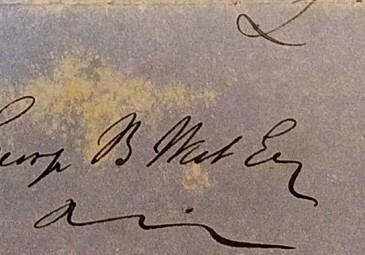 Redmond wrote to MacNeill immediately after making his pledge of the Irish Volunteers in the House of Commons on 3 August, informing MacNeill that ‘[o]ur position has been improved enormously by the foreign complications. Do not let us by our folly and temper destroy the situation’. Despite serious misgivings at Redmond’s new departure, MacNeill was convinced to hold his tongue for the time being. Throughout August and September 1914, the War Office and members of the British General Staff pressured Redmond to extend his pledge of the Irish Volunteers to a call for them to fight overseas. British military strategists deemed an invasion of Ireland extremely unlikely but they urgently needed troops to augment the ranks of the British Expeditionary Force then already engaged on the battlefields of Europe. Redmond held out, awaiting further concessions on Home Rule. 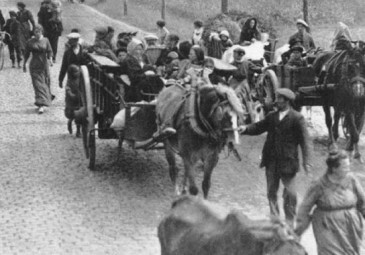 The progress of the 1912 Home Rule Bill through parliament had been arrested by the outbreak of the war. On 18 September 1914, the bill finally became law, being placed on the Statute Book as the Government of Ireland Act 1914 alongside an amending act which suspended its implementation for the duration of the war and pending satisfactory resolution to the Ulster question. 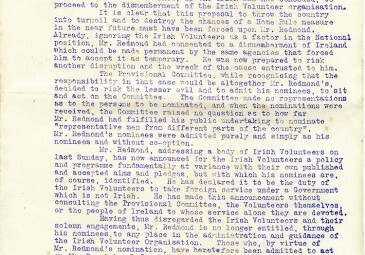 Satisfied that his life’s work had been achieved – albeit on paper and not in fact – Redmond immediately informed the House of Commons that he would journey to Ireland and exhort the volunteers to fight in Europe. This he did two days later at Woodenbridge, county Wicklow. MacNeill’s response to Redmond’s Woodenbridge speech is a fascinating document. It was written with vitriol and immense energy. 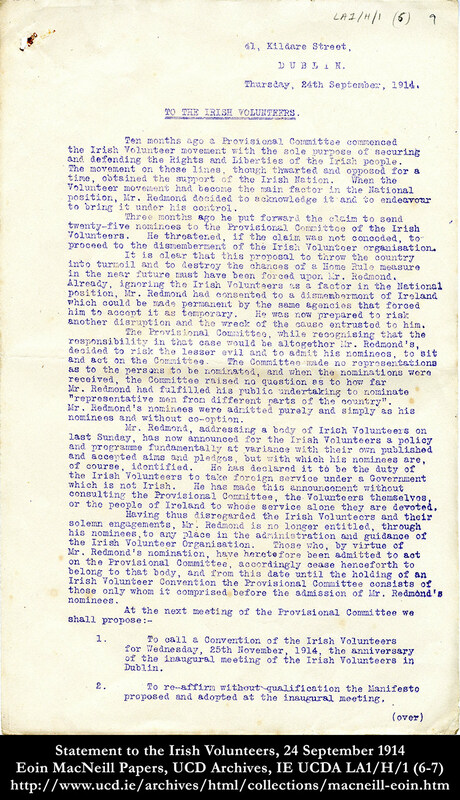 In contrast to Redmond’s speech at Woodenbridge, the statement of 24 September is a collaborative document, having been signed by MacNeill and nineteen other members of the original provisional committee of the volunteers. The signatories note that Roger Casement would also have put his name to the document had he not been in America at the time. The signatories of the document wrote with the confidence that they fully understood the founding principles of their movement. They were resolute in their belief that Redmond had deviated from the core values of the organisation and thus had lost any right to control a force that had been handed over to him only in the interests of unity and with the cautious assent of its founders earlier in the summer of 1914. In discussing the ‘recent outrages in Dublin’ towards the end of the document, MacNeill was referring to the Bachelors’ Walk Killings of 26 July, underlining the deep animosity towards the British military felt among a section of Dublin’s citizenry. This can be seen to have contributed in no small way to the utter disapproval of the signatories of any policy that called for cooperation with the military and the war effort after four unarmed civilians had been killed and thirty-seven injured in Dublin just days before the formal outbreak of the war in Europe. MacNeill’s statement is uncompromising on the issues of Irish self-government and partition. Whereas Redmond had conceded ground both on partition and the timeframe for the opening of an Irish parliament, it is interesting that MacNeill asserts that none of the achievements of Nationalist Ireland would have come about without the Irish Volunteers. As stated previously, MacNeill’s faction, despite precipitating the split and retaining the title of ‘Irish’ Volunteers – Redmond’s breakaway force took the title ‘National Volunteers’ – was not successful in attracting the majority of the rank and file of the movement. In the weeks following the publication of this statement, units and individual volunteers nationwide made up their minds about how they would side on the issue. Ultimately, 158,300 volunteers sided with Redmond whereas a mere 12,300 sided with MacNeill. What is often forgotten is that Cumann na mBan also split on the same issue, with the majority of women also taking the Redmondite position. However, Redmond’s volunteers faded out during 1915 – perhaps owing to the declining popularity of the war after large scale losses at Gallip0li and the Battle of Loos. On the question of enlistment, one source from within the leadership of the National Volunteers states that Redmond’s force was also not overly successful as a British Army recruitment channel and that only 25,000 National Volunteers (one sixth of the force) had actually joined the British Army by February 1917. Finally, before leaving this month’s document, it should be noted that the list of twenty signatories is something of a who’s who of the later Irish revolution. All the signatories were known names – both in Dublin Castle and in advanced nationalist circles – in 1914. However, many of them drifted into relative obscurity after this point. Notable among these is Michael J Judge, who had been a prominent volunteer from the establishment of the movement and had made headlines when he was injured with a bayonet in clashes with police and military at Clontarf as freshly armed volunteers returned to Dublin following the Howth gun-running of 26 July 1914. Between the split and the Rising, Judge appears to have ceased to be involved with the Irish Volunteers and his memory has largely been lost to history. However, among these now largely forgotten figures are also names that have entered the pantheon of Irish nationalist memory. 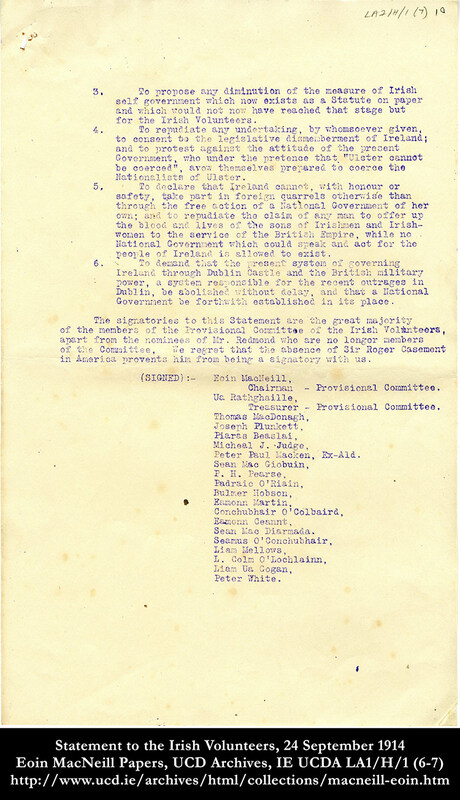 Among the names here are five of the seven Easter Proclamation signatories; O’Rahilly, the highest ranking combat casualty of the Rising; Con Colbert, another of the executed; Piaras Beaslai, the celebrated military propagandist of the War of Independence; and even Liam Mellows, one of the leaders of the Four Courts Garrison during the Irish Civil War. Underlining the nature of that later conflict, Mellows and MacNeill found themselves on opposite sides of a bitter and, for Mellows, ultimately fatal divide. Alongside the still-birth of the Government of Ireland Act and Irish participation in the First World War, the split in the Irish Volunteers was one of the formative events of the year 1914 in Ireland. Combined, these events would define a decade of Irish political life and martial conflict. In the shadow of the well-known Woodenbridge speech, MacNeill’s illuminating response should not be overlooked. Up until the Easter Proclamation, it is arguably the clearest statement of principle from that nationalist minority which ultimately won a retrospective mandate and justification at the polls in the 1918 general election. Underlining the fracturable nature of Irish politics, even those who united in signing the document in opposition to Redmond would not stay united for long. MacNeill would clash with the rebels in advance of the rising and with Mellows in 1922. Until it was split, the brief existence of the Irish Volunteers can thus be seen as a remarkable moment of concord in the history of nationalist Ireland.